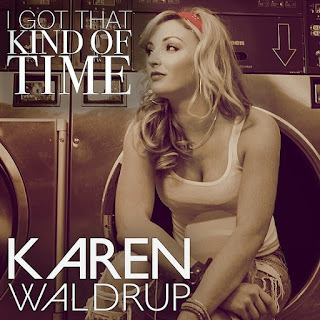 International media power player CMT world premiered the music video for rising star Karen Waldrup’s music video for “I Got That Kind of Time” today across all platforms. Since the video for the independent artist was released this morning, it’s landed on the top trending spot on CMT.com. “I Got That Kind Of Time” is an upbeat, energy-filled tune devoted to the special people in everyone’s life, whether its a spouse, family member or friend, that warrant spending time with regardless of the situation. The music video, directed by Billy Brown of Evidential Productions and starring well known fishing model Brooke Thomas, really focuses on the heart of this song with the polar bear character that represents those special people in everyone’s life. Check out the polar bear in the “I Got That Kind of Time music video here. “The Polar Bear is symbolic of every single person in your life that you care about. He appears in random, unexpected places, just as it often happens when you’re making time for people you care about in your own life,” explains Waldrup. “We had such a blast filming this video and had a great team of people that came together to make it happen." GigTown is also a fan of the song and named "I Got That Kind of Time" the "Song of the Week." They praise the song saying, "there's an immediate lightness to this decidely carefree track of Waldrup's ... she makes being pressed for time sound like the last thing on her mind. Waldrup is an indepedent artist that tours extensively throughout the world and is continuing to cross the country this year connecting with and entertaining fans, new and old alike. Catch her on the road in the cities below this fall or on Facebook live, as Waldrup prides herself on broadcasting every show live on her Facebook fan page.